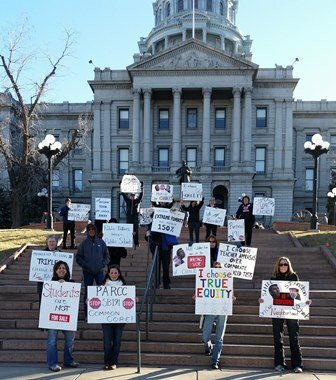 DENVER, CO (January 30, 2015) – Counter protesters gathered Monday in front of the state Capitol building to challenge the takeover of neighborhood schools by Charters. Their message was simple, since the charterization of neighborhood public schools, students and families, the majority of whom attend neighborhood public schools, have fewer choices. Senator Michael Johnston, who joined Senator Owen Hill as the legislative face at Monday’s Charter School rally, instituted the PARCC test as the state’s standardized test and tied teacher’s salaries to test scores in Senate Bill 191. “Common Core, PARCC and the high-stakes of performance pay and school labels have taken away choice for students and parents in public schools,” said Anita Stapleton a parent who traveled 130 miles to attend the event. 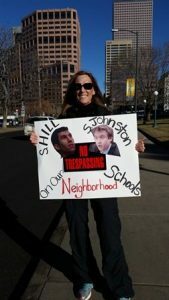 Protesters to Monday’s “CHOICE” rally included urban, rural and suburban parents from public Magnet schools to parents so frustrated by the lack of legitimate choice that they are homeschooling. Republicans and Democrats are coming together to advocate for the rights of parents and students to Opt Out of these one-size-fits-all reforms. 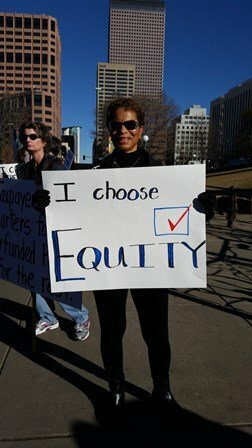 The intended message of Monday’s Rally was “school choice is working for Colorado families”. 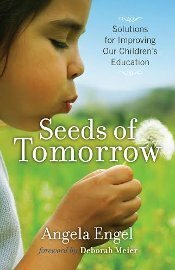 Children’s advocate and author Angela Engel says that is not true for most students. “In the last decade the number of students identified as “at-risk” has doubled and many schools have poverty rates above 80%. “The charter movement is generating billions of dollars in private profits. Efforts to divert public dollars to private interests have resulted in re-segregation and greater inequities in our education system,” said Engel. Many reports including, “Schools Without Diversity” have shown that the growth of Education Management Organizations and charter schools contribute to gentrification of neighborhoods and racial stratification.